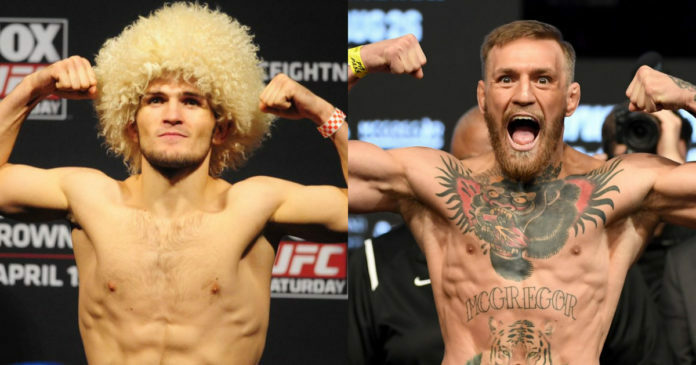 Conor McGregor and Khabib Nurmagomedov finally came face to face last Thursday. Whether you enjoyed the UFC 229 press conference or not, it’s difficult to argue it wasn’t an explosive meeting. Whether you liked Conor’s approach or not, you can’t accuse him of phoning it in. With a small crowd of sycophantic journalists in front of him and an empty theater devoid of his usual fan support behind him, he gave his all to promote the fight and invade the cerebrum of his counterpart. The one question you can ask: did he go too far? Reclaiming the spotlight with his trademark swagger and tailored suits, Conor sauntered onto the stage with two belts and a bottle of his new whiskey, Proper Twelve. It almost felt like Conor never left. He did, of course, for two years, resulting in those two belts over his each of his shoulders becoming ornaments. I for one liked this move, remind people that even though you were stripped you’re still the lineal champion of two divisions. More stakes never hurt a pay-per-view. Khabib Nurmagomedov stepped out with a reserved expression, fully aware this next half hour of his life was to be a particularly long one. The Dagestani sat down, bolstering himself against the vitriolic verbal offence about to come his way. It did, with gusto. McGregor wasted no time making this fight as personal as he could. From Khabib staying on the bus to his father to politics to the entire history of both the Dagestani and Irish people. Conor revised for this. Of course, directly insulting another fighter’s family and heritage is not really the done thing in MMA promotion. In this case, it was to be expected however. According to McGregor, the business between himself and Khabib is life and death, “if he’d have gotten off that bus he’d be dead, and I’d be in a cell.” Conor McGregor takes his friendships very seriously, and Khabib’s cornering and questioning of SBG Ireland member Artem Lobov in a hotel hallway is apparently a high crime in the land of McGregor. So, nothing was off the table for the “Notorious One”. He even threw some personal digs at Khabib’s manager, referencing his son whom he allegedly owes a substantial amount of child support to. What was really amazing about the whole affair was Conor’s ability to make the room seem full of energy. Compensating for the lack of fan presence, he put out a crowd’s worth of frenetic-ism. This however, led to what some people see as jumping of the shark moment for the self-proclaimed “king”. The personal stakes and overcompensation for lack of frenzied fans meant McGregor was operating on a different level. Add in a little of the Irish whiskey and things quickly turned up to 11. When he wasn’t monologuing political theory and calling Khabib a rat, he was stuttering, slurring and repeating himself. At several points he even took to just making bizarre animal noises into the microphone. It was an eclectic showing to say the least. Khabib on the other hand was sitting at a cool 4-5, never showing emotion or reacting to Conor’s ranting, raving and roving. 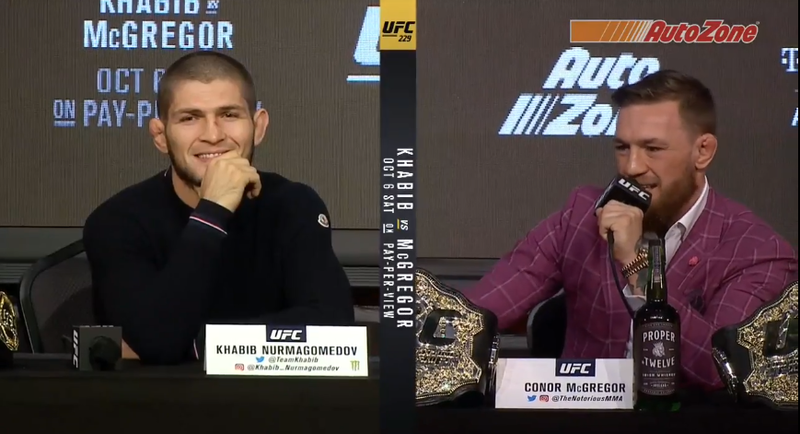 McGregor even offered the devoutly Muslim champion a glass of his new whiskey, to which Khabib politely refused with nary a rise in tone. Like any press conference of this magnitude, discussion immediately turned to assessing the victor. Who won? Some think Khabib played the iceman in the face of Conor McGregor’s madness with conviction. Many think that despite the Russian remaining stone faced, the former champ champ got to him with repeated salvos of personal and political insults. It’s hard to imagine anyone not being rattled by Conor’s onslaught, but it’s equally difficult to assume Khabib turned up with any other expectations. What can be made of Conor’s chaotic demonstration though. Marauding around the stage, clearly drunk. Is this too personal for him? We’ve never seen him so incensed, so manic. Except, have we not? Remember, this is the same man who tried to attack Eddie Alvarez with a chair, then went on to deliver the most composed and conservative performance of his career, with all the pressure of carrying the UFC’s first trip to MSG. When Conor McGregor wants to inject ice into his veins, he can and will. Until I see otherwise, I refuse to believe this drunken insanity (and to be fair, it was bloody intense) has any bearing on the fighter who steps into the cage. It’s fun to think we learnt a lot from this first face to face meeting. “Conor is losing it”, “McGregor is too emotional”, “He’s in Khabib’s head”, “Khabib played it cool”, “No one can get in Khabib’s head”. Ultimately, the point of a press conference is to drum up public interest and help people understand the personal stakes. Some people didn’t like McGregor’s over the top antics, but at the end of the day, we were all entertained. That’s really the most we can ask of these press conferences. Really, how much can we divine about the fight itself from 30 minutes of venom spitting? I believe in this case, very little. Everything went exactly as most thought it would. But, when it’s time to get down to business, Conor McGregor and Khabib Nurmagomedov do work. We should enjoy these little distractions along the way for what they are. Images courtesy of scrapdigest.com, sportsjoe.ie, joe.ie and hotnewhiphop.com.